Testing the water chemistry and balancing with necessary spa chemicals. Vacuum any debris from spa. Maintan records of each service and communicate any concerns. Drain and fill as needed. We must have water access! This is needed to clean your filters, top off your tub when needed and to perform drain and fills as needed. Snow must be removed from around your tub and driveway so that we have adequate access for your services. Failure to do so may result in your tub not being serviced as scheduled. Should we have to remove snow to access your tub, there is a charge of $1.00 per minute spent removing snow. 1) I understand that although the chemicals needed to balance & sanitize my tub are included in the price of the chemical service that Nature2, Silver Ion and filters are NOT part of the inclusion and that they will be billed as they are needed. 2) I understand that this maintenance program is just for chemicals & that any service work needing done are additional and not part of this contract. 3) I understand that this maintenance program does not include water services such as draining, filling or purges but are available at an additional cost. 4) I understand that the manufacturer suggests doing a drain & fill every 3 to 4 months & after that time period there is a good chance the water might not recover or respond to sanitization efforts making it necessary for a drain & fill which will ensure the safest water possible for my family & guests. 5) I understand that Bear Dance Spas concern is safe water which means in a critical situation: water is unrecoverable (highly unsafe) & they are unable to reach me, I give them permission to take the necessary steps needed to ensure that the water is. 6) I understand that if my hose bib is frozen that Bear Dance Spas will install and bill for a Frost Bonnet. Fill out form below or download the Water Care Agreement here. How often do you use the spa? 1) I understand that although the chemicals needed to balance & sanitize my tub are included in the price of the chemical service, that Silk Balance and Silver Ion and filters are NOT part of the inclusion and that they will be billed as they are needed. 2) I understand that this maintenance program is just for chemicals & that any service work needing done are additional and not part of this contract. 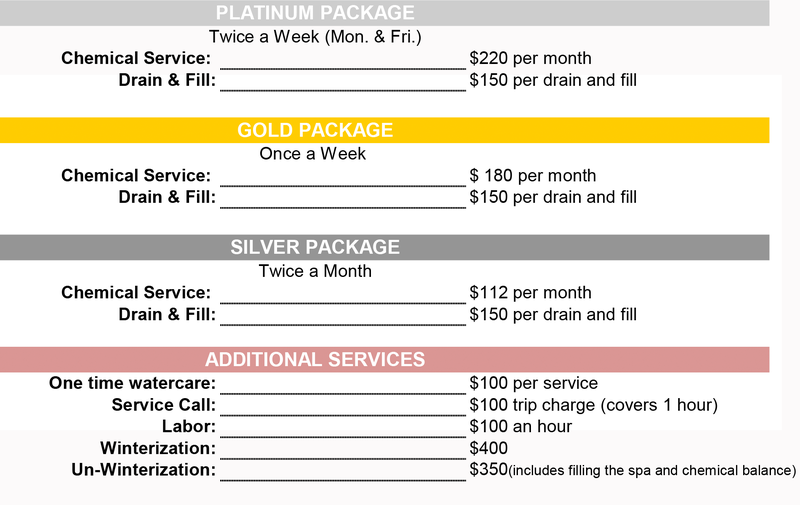 3) I understand that this maintenance program does not include water services such as draining, filling or purges but are available at an additional cost. 4) I understand that the manufacturer suggests doing a drain & fill every 3 to 4 months & after that time period there is a good chance the water might not recover or respond to sanitization efforts making it necessary for a drain & fill which will ensure the safest water possible for my family & guests. 5) I understand that Bear Dance Spas concern is safe water which means in a critical situation: water is unrecoverable (highly unsafe) & they are unable to reach me, I give them permission to take the necessary steps needed to ensure that the water is safe for my family and guests. 6) I understand that if my hose bib is frozen that Bear Dance Spas will install and bill for a Frost Bonnet. Bear Dance Spas guarantees your water to be balanced and sanitized upon departure of our visit. 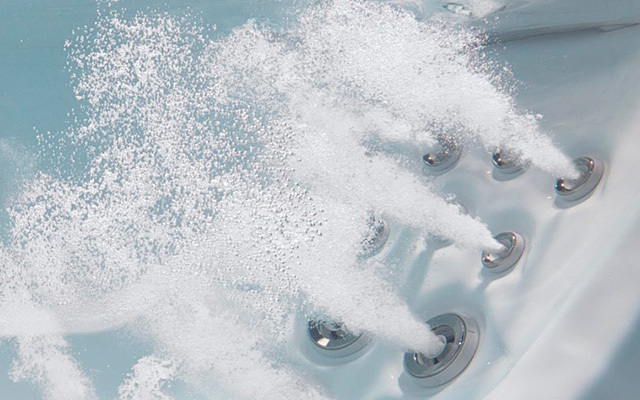 For the best water chemistry we encourage the following from our customers to ensure the best possible experience in your tub: 1) an operational and functioning ozonator, 2) "shock" treatment applied after each usage.